The polar vortex has struck again, and I'm on a self-imposed lock down. I had an event to attend last night, and was actually super excited about it (it was 60s ski party themed!! ), but...I could barely get around the block, let alone 100+ blocks. So instead of parties and cocktails, it was braised lamb shanks and The Mindy Project (so good!) and working on the couch in my fleece-lined leggings (admittedly, not a bad compromise). 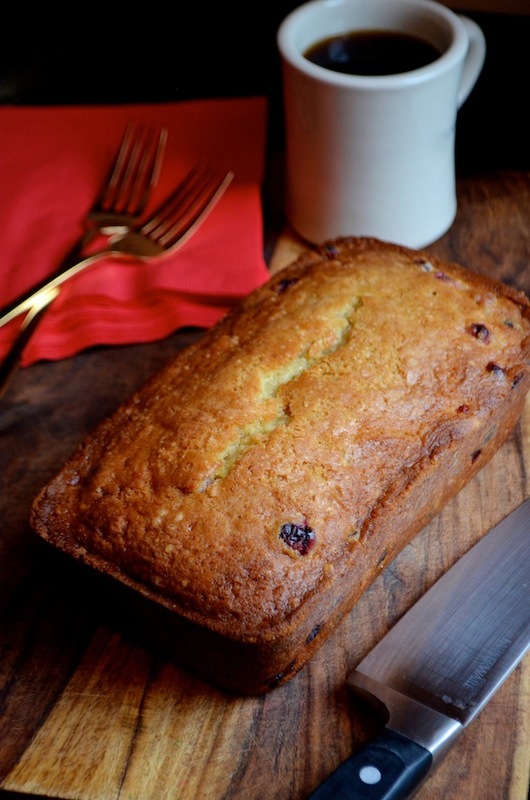 We're lucky to still have a few slices of my Cranberry Orange Chocolate Chip Loaf Cake leftover from last weekend's brunch. I love this cake. 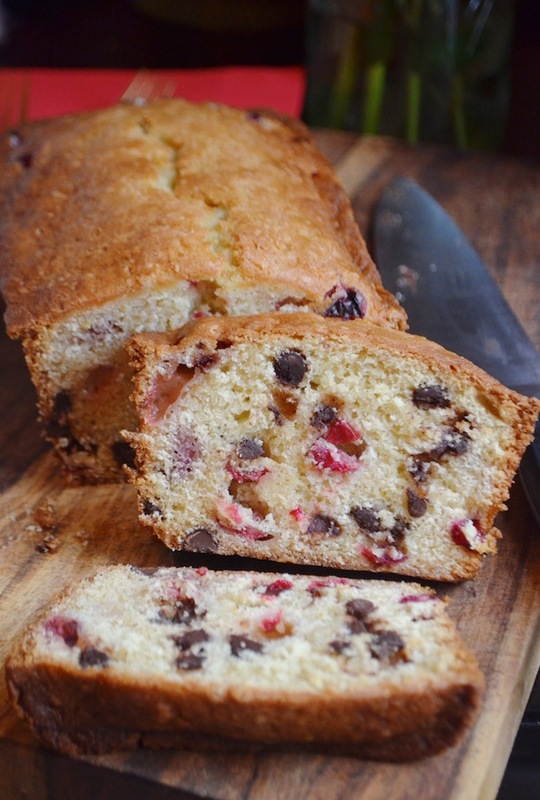 It's moist and tender with the perfect amount of tart fresh cranberries and dark chocolate chips studded throughout. I did keep one very awesome thing about the original recipe, which is that the main liquid in it is orange juice. Just pure juice--no buttermilk or anything else! It adds this lovely flavor to the whole thing and is (to me) the perfect winter cake. Great in the late morning with a mug of coffee. Lovely as a light dessert after lunch. And simply fantastic in the evening when snuggled up on the couch watching television. Even better? This recipe makes 2 loaves with no extra work. One to keep and one to share. Or one to eat and one to freeze (for later). Makes 2 9x5-inch loaves. Adapted from Joy the Baker. Preheat oven to 350 degrees. Grease and line two 9x5" loaf pans with parchment paper so that it overhangs on the sides. In a large bowl, whisk together flour, sugar, baking powder, baking soda, and kosher salt. In a separate bowl, whisk together melted butter, eggs, orange juice, zest, and extracts. Add the wet ingredients to the dry and mix until combined with no dry spots left. Gently fold in the cranberries and chocolate chips. Divide the batter evenly between loaf pans, and bake about 50-60 minutes, or until a tester inserted in the center comes out clean. Remove from loaf pans and let cool completely on a rack.